Anova is sending me one for free! Had a local butcher shop cut me a tri tip. Turns out it was from a Wagyu steer. . Was a small cut though, about 1.2lbs. Sous vide it at 127°F for 2 hours with salt, pepper and a couple smashed garlic cloves. Seared on a smoking hot grill. Sliced thin, wt it on some pita wedges with carmelized onions, shallots and mushrooms, plus some aged cheddar. Forgot to snap a pic, but it was damn good. Bison steak and rib cap done at 125 for two hours. The bison was defrosted overnight and the rib cap was from the freezer. Both came out perfect. Seared the rib cap in a pan and the bison with a mini torch. Currently cooking some buttermilk marinated chicken for dinner tonight. 145.5 for two hours. Cool, dust with starch coating, cook again, then batter/deep fry. Marinate contained some brine from my last batch of hot sauce. Should be spicy. I did a bunch of Veal Rib chops yesterday. Simple salt and pepper seasoning. Cooked about 3.5 hours @129° then seared off on the sear burner. My father, who loves Veal chops, said it was probably the best he's ever had. Did some lamb ribs yesterday, and they came out fantastic. 18 Hours @ 134°. After the bath, I seasoned with rub, and threw them on the smoker for 45min @ 180°. Finally I seared them off on the sear burner. Super tender and moist. The meat had a velvety consistency. I can't attest to how well this brand works, but Woot.com (Amazon) has a sous vide machine on special today for $54. I'm chuckling at w00t's pricing fail of charging $4 more (and maybe shipping?) for a discontinued version on this one. Something I thought of the other day about these off brands was when the clip broke on my Anova. One email to CS about the problem and they mailed me a new clip within 24 hours at no cost for the clip or shipping. It didn't matter to them that I couldn't provide an order number from 2-3 years ago because I had deleted the emails. Apparently, at least right now, the Anova clamps are lifetime free replacement. I've read on their forum of them sending out new clear bottom caps at no cost too. Will these other companies be around or even care to replace parts that break? At least Anova being owned by Electrolux, will be around for a while. and worth about as much. Anova bluetooth is now on Amazon Prime day for 79.99. Doesn't have the fancy stuff but mine works like a charm. 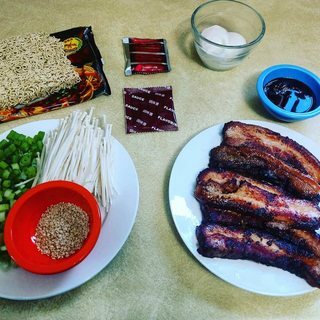 Wonderful ramen for dinner tonight with sous vide pork belly! Sorry for not getting back to you on this! I did it for just over 12 hours. Eric, I've seen mine go nuts before due to some external conditions. How was the water level and what direction were the vents on the back of the unit facing, were they over the clamp or were they turned sideways? Was the pot covered with a lid or saran wrap?